If you thought it sounded human, you're right. It does. But that's not a human making the sound--it's a beluga whale named NOC. Shh. The beluga is listening. Dolphins have been trained to mimic people, but the fellow in this recording apparently picked up human-sounding lingo on his own. Researchers describe his acquisition as self taught. According to this BBC story, the way the white whale pulls it off isn't easy--he had to really work at it in a pretty un-beluga-like way to get his voice so much lower than the normal beluga vocalization. 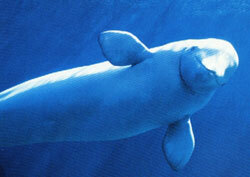 You can listen to the typical beluga talk, which sounds like a dyspeptic piglet trapped by a creaky door here. It sounds. Ed Yong at Not Exactly Rocket Science tells us these whales are sometimes called "sea canaries" but that they usually sound like children in the distance. To me, this human mimicry sounds like nothing as much as men on a fishing boat, hollering at each other over the wind, just as they might sound to ears underwater. In fact, the way the researchers found NOC, according to the BBC story, was when a diver surfaced, thinking he'd heard someone tell him to get out. Remembers me of a good science story. An experiment implies a chimp, a table, a chair and a banana hanging. Chimp needs to put the chair on the table to reach the banana. Maybe because I'm a skeptic, but it just sounds like random sounds to me. Why is it that we MUST believe it sounds human? Could it be just that of all the sounds that dolphins and whales make, we happen to record the ones that sound human like, yet ignoring the millions of sounds they make that do not? Wouldn't we call this confirmation bias, or observation bias? If this behavior were so typical, why wouldn't have been observed by more captured belugas? I think we try to see things that confirm human importance or that importance of other species being human like. But I'd need more evidence than this recording, which, at best, may be mimicry. To assume that it is intelligent "speech" is making a scientific conclusion based on the lamest of non-evidence. They first heard him producing the sounds then trained him to produce them on command so they could record them; there's some intentional behavior involved in that, I infer. Also, the frequency he's using is way out of bounds for recordings for cetaceans, from what I understand. They're not alone in that taxon for their mimicry of humans, from what I understand; this just happens to be the first who seems to be "self taught." For what it's worth, Ed Yong thought it sounded like a kazoo. I don't believe the authors thought it was "intelligent speech"; indeed, in their abstract, they describe it as mimicry. Where did you see a reference to "intelligent speech"?